﻿ ﻿ The Director of Architectural Services, Mrs LAM YU Ka-wai, Sylvia (right), briefs the Secretary for Development (SDEV), Mr WONG Wai-lun, Michael, on the various environmental-friendly and energy-saving design features adopted by the Trade and Industry Tower (TI Tower) to keep in line with the “Green City” sustainable development concept of the Kai Tak Development (KTD). 2. 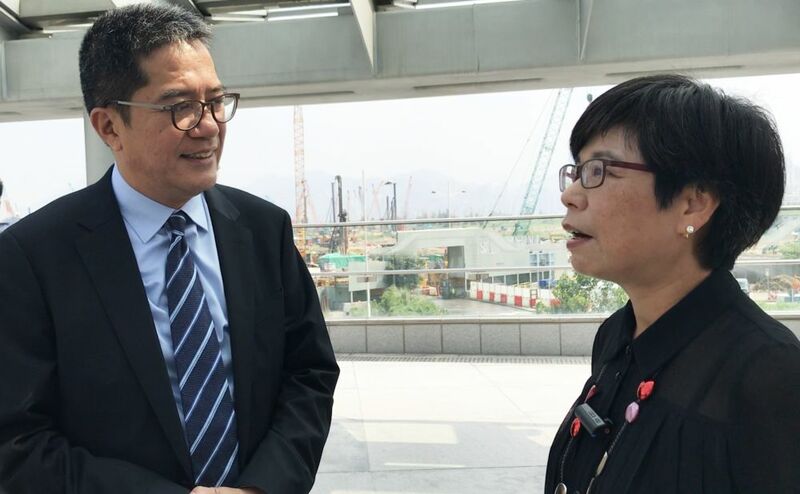 The Director of Architectural Services, Mrs LAM YU Ka-wai, Sylvia (right), briefs the Secretary for Development (SDEV), Mr WONG Wai-lun, Michael, on the various environmental-friendly and energy-saving design features adopted by the Trade and Industry Tower (TI Tower) to keep in line with the “Green City” sustainable development concept of the Kai Tak Development (KTD).